BOGOTA — Bullfighting returned to Colombia's capital city on Sunday amid a large and loud protest that suggests the old sporting tradition is becoming increasingly unpopular among the country's youth. 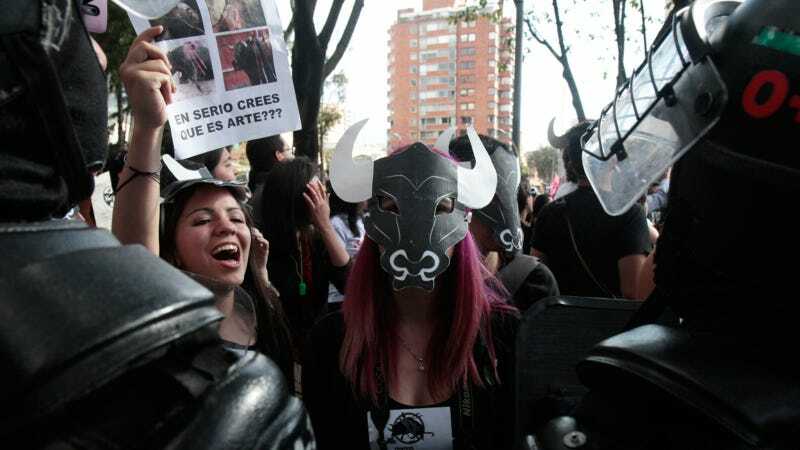 According to police reports, some 5,000 people turned up outside Bogota's bullring on Sunday to protest the city's first bullfight in five years. Most of the demonstrators were in their twenties and thirties, and some dressed in black to mourn the violent deaths of the six bulls that were killed during Sunday's event. Protesters started to gather early in the day at the entrances of the bullfighting stadium to shout obscenities at fans who filed into the arena. Class tensions were evident, as affluent bullfighting aficionados dressed in Panama hats and designer sunglasses hurried past the protesters, protected by a large contingent of police officers. As the bullfight began, scuffles broke out in the street between police and a small group of protesters who attempted to break through one of the barricades. Cops in riot gear used tear gas to disperse the more radical element of protesters. According to Colombian police, 11 people were injured during the protest, including a local government official who was hit in the face with a brick. Three minors and two adults were arrested. Overall, however, the protest was peaceful. It's the start of what animalistas promise will be a sustained effort during the local bullfighting season, which lasts until the end of February. “Society is very sick if it thinks that watching how an innocent animal suffers, gets tortured and dies is a form of art,” tweeted activist Orlando Beltran. Bogota's bullring was closed in 2013 by leftist Mayor Gustavo Petro, who argued the spectacle was inhumane and out of touch with 21st century values. But the bullfighting ban was later reversed by Colombia's constitutional court, after bullfighting promoters successfully argued that Mayor Petro was denying them the right to practice an ancient tradition protected by the constitution. The high court determined that only Colombia's congress has the authority to ban bullfights. Animal rights activists are planning to appeal the ruling, while also pushing for an anti-bullfighting law in congress. The new mayor of Bogota, Enrique Peñaloza, says he had no option but to enforce the court's ruling, even though he openly opposes the bloodsport. The capital's bullfighting arena, which seats around 10,000 people, was packed on Sunday, as fans got their first chance in five years to see a fight in the city. The event was attended by a former vice-president, a famous leftist journalist, and the country's ultra conservative former inspector general, who is expected to be a leading candidate in the next presidential election. But many fans in attendance were part of an older generation—Colombians in their fifties and sixties. Younger politicians and celebrities have mostly sided with protesters who are against bullfighting.